Looking for new learning opportunities for your students? Zoom offers exciting ways to integrate video communications into your classroom! Check out our list of ten ways to use Zoom to enrich your students’ learning experiences. Virtual Field Trips: Reach out to museums and national monuments to take your students around the world without them ever leaving their seats! Zoom’s easy set up and mobile compatibility makes it a snap for staff to give tours right from their phone. Guest Lectures from Real-World Professionals: Learning about cells? Or European history? Data Science? Reach out to biologists, historians, analysts, and other professionals for guest lectures to supplement your curriculum. Zoom’s in-meeting messaging or webinar Q&A function helps manage student engagement! Connect with Other Classrooms: Connect with other classrooms not only in your district or state, but in other countries as well! Collaborative learning, and learning about their peers in other cultures can be an enriching experience for students. Connect with Foreign Language Natives: For foreign language classes, give your students genuine language practice and a first hand experience of the language and culture by connecting with a native speaker. Explore Careers: Get your students excited about their future careers by connecting with professionals who can talk to them about their daily activities, lifestyles, and education/training. This valuable opportunity to network could even land them their next job! Enable Participation for Students Out of the Classroom: Don’t let students fall behind on classwork because they are out sick. Have them join the classroom virtually through Zoom, or simply record the lecture for them to watch later. Virtual Parent-Teacher Conferences: Zoom’s meeting features such as messaging and raise hands make for an awesome way to host intimate parent-teacher conferences! Time-strapped working parents will appreciate the flexibility and ease of this option. Hold Tutoring Sessions: Holding tutoring sessions over Zoom saves time and creates more availabilities for students with packed schedules. Instead of having to block out a period of time, when students may not even show up, Zoom allows you to schedule sessions when it’s most convenient for you and your students. Teach from Home: Feeling sick? Instead of pushing back lessons and finding a substitute, why not teach from home and have everyone join on Zoom? And you don’t need to change up your lesson plan to fit a virtual environment. 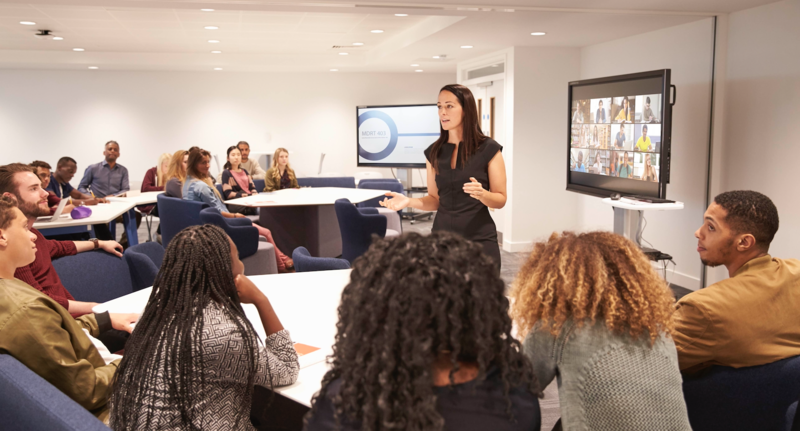 Zoom’s meeting features, such as video breakout rooms, are perfect ways for students to engage in the same dynamic virtual learning environments from their laptops and phones. You can jump from breakout to breakout as the session host. Connect with Pen Pals: Pen pals are a timeless way for young people to expand their horizons. Your students will have a much more meaningful experience being able to meet face to face over Zoom with their pen pals. Zoom is a global service that works well even in low-bandwidth environments, so they’ll have no trouble connecting with their peers. Want to hear more ways Zoom can enrich your classroom experience? Sign up for a personalized demo today!